The pilgrimage is all about letting go, a time to see ones daily life as it truly is. The Three Day Pilgrimage provides a kind of breathing space in which people can calmly explore and reflect on where they find themselves in their lives at that moment in time. Part of the spiritual benefits of any pilgrimage is learning to take nothing we have for granted. It is an opportunity to give thanks to God for having the health, the time, and the freedom to do the pilgrimage. It’s a moment to remember one’s loved ones at home and anyone who particularly asked for prayers, and also to say a prayer for fellow pilgrims. Lough Derg is a sacred place apart to bring burdens and leave them behind, to seek healing for wounds and to ask for them to be healed. These are just some of the reasons pilgrims continue to come to this sacred Island. The Vigil lasts 24 hours, beginning after Night Prayer on the first day of the pilgrimage and ending after night prayer on the second day. At the heart of the Three Day Pilgrimage is the 24hr Vigil, where pilgrims journey together in watchful prayer. Liturgies celebrated during the pilgrimage include Eucharist, Reconciliation and the Way of the Cross as well as other communal times of prayer. The Vigil is more than keeping awake, the Latin meaning connects it with being vigorous and lively. So being on vigil means being open and alert, on the lookout, watchful and expectant. The pilgrimage enables us to see our daily lives as they truly are, time spent in this sacred space undertaking the pilgrimage programme can help us bring a new focus to our lives. The Lough Derg fast reminds us of the daily reality that faces many people in our world today. One simple meal is had each day during the Three Day Pilgrimage. The meal consists of tea/coffee (no milk, sugar available) dry wheaten bread & toast, oatcakes. Gluten free bread available. Pilgrims choose when to have their Lough Derg meal during the day, either early afternoon or evening. On the third day one meal similar to the above can be eaten after leaving the Island & soft drinks can be taken throughout the third day. Water and prescribed medication allowed at all times. During the Three Day Pilgrimage there is time for reflection on Day 2. Lough Derg is a great place to bring burdens and leave them behind and often it is the unexpected that surprises us – a thought emerges, a new idea, a different way of looking at something. Or perhaps, the gift of this time away from everything provides an opportunity to be at peace, to empty the mind and to listen to the whisper of our God. The ebb and flow of the pilgrimage – the strenuous pilgrimage exercise coupled with times of peaceful reflection – are about opening us to receptivity, about finding a new honesty and humility that we can take with us into our daily lives. Nine Station Prayers are completed over the three days. Each Station Prayer can take around an hour to complete and after a while it becomes meditative. The first, second and third ‘Stations’ are made on the Penitential Prayer Beds on Day one. Pilgrims make the fourth to seventh Stations together in St Patrick’s Basilica during the night Vigil. The eighth Station is completed during Day Two and the ninth before departure on Day Three. ‘Station’ refers to the combination of prayers and movements which make up the Station Prayer. These prayers can be more than thoughts and words, they could be called body prayers: the emphasis is on kneeling and walking while reciting very basic prayers: Our Father, Hail Mary and Creed. The prescribed prayers to make a station are outlined in the Pilgrimage Exercise Leaflet which is available on arrival. ‘Penitential Prayer Beds’ are the remnants of the old beehive ‘prayer’ cells used by the monastic community as far back as the ninth century. 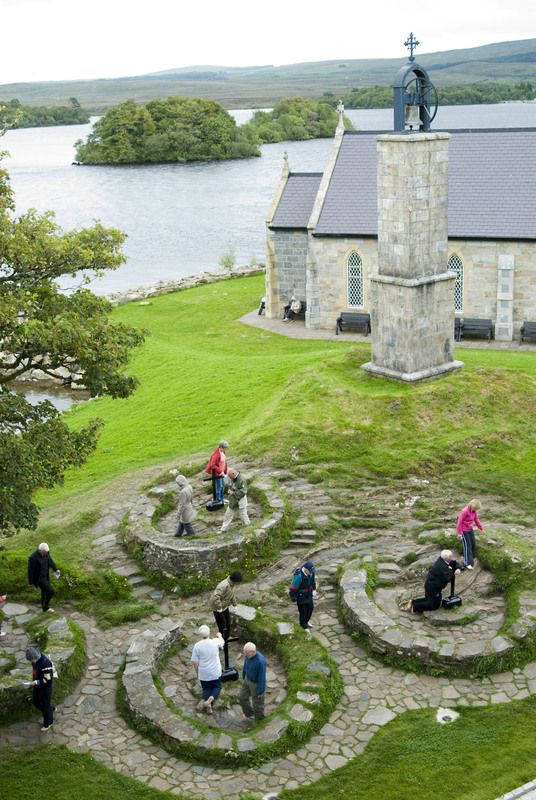 They are the oldest remaining structure on the Island and form the central part of the prayer programme.